We present two diverse case reports of OS involving the maxillary jaw in a 54-year male and a 43-year female who were clinically and radiographically misdiagnosed. They were reported histopathologically after wide surgical excision as chondroblastic OS and osteoblastic OS, respectively. A 54-year-old otherwise healthy businessman reported to a dental practitioner with mobility of upper right teeth and pain on chewing since 2 weeks. On intraoral examination, he was clinically diagnosed to have localized periodontitis with gingival swelling and grade II mobility of 14 (right maxillary first premolar). OPG showed localized alveolar bone loss and widening of the periodontal ligament space in relation to 14 [Figure 1]a. Extraction of 14 along with excision of the gingival swelling was done under local anesthesia and antibiotic coverage. Excised gingival lesion on histopathological examination was reported as peripheral giant cell granuloma. Recurrence of the lesion occurred at the same site within 10-12 days, and he was advised reexcision. After 1 month, he reported to our primary health care center for surgical excision of the said gingival lesion. Clinical examination revealed a 4 × 5 cm well-defined firm sessile asymptomatic gingival swelling in 13-15 regions (right maxillary canine to second premolar), overhanging the 14 extraction socket and covering the cervical third of 13 and 15. The surface was smooth, interspersed with erosive areas, having grayish white to pale pink mucosa [Figure 1]b; 13 and 15 were caries free and had grade I mobility. Regional lymph nodes were not palpable. A wide surgical excision with extraction of 13 and 15 along with interdental alveolar bone septal osteotomy was performed under general anesthesia. No perforation to maxillary sinus or erosion of palatal bone was noted. Primary closure of surgical site was done using buccal flap. The hematoxylin and eosin (H and E) sections showed lobular areas of chondroblastic differentiation with atypical chondrocytes and chondroblasts, and actively proliferating fibroblast showing nuclear and cellular pleomorphism [Figure 1]c. Peripheral areas of few of these lobular areas showed formation of disorganized woven immature bone [Figure 1]d. Focal areas of atypical haphazardly arranged spindle-shaped cells with myxomatous areas and few diffuse bizarre multinucleated giant cells were seen. Based on these varied histopathological findings, a diagnosis of chondroblastic OS was given. Previous histopathological slides could not be reviewed. No characteristic bone changes could be detected on CT examination. Chest X-ray was reviewed for metastatic lesions in the lungs and none was detected. Case was referred to higher oncology center where partial maxillectomy and adjuvant chemotherapy were performed. After 1.6 years, the patient is doing well with no reported recurrence. A 43-year-old otherwise healthy housewife reported to a head and neck surgeon with a chief complaint of right nasal obstruction since 1 month. Routine paranasal sinus x-ray showed a dense sclerotic radiopaque mass obliterating the right maxillary sinus with deviated nasal septum. On clinical reevaluation at our primary health care center, a mild facial swelling along with mild proptosis of right eye with no apparent restriction of eye movements or vision was noted. Intraoral examination showed obliteration of the entire right buccal sulcus by a diffuse bony hard mass covered by a normal appearing oral mucosa; 16 (right maxillary first molar) had deep mesial class II carious lesion, with extrusion of 16 and 18 (right maxillary third molar). Grade I painless mobility of 16 and 15 was noted; 46 and 48 (right mandibular first and third molar) were missing with a history of extraction after carious exposure 6-8 years ago. Regional lymph nodes were not palpable. OPG showed dense to mixed sclerotic radiopaque mass of the right maxillary sinus along with widening of the periodontal ligament space of 15-18 [Figure 2]a. CT scan showed mixed sclerotic mass involving the right maxilla and nasal cavity with involvement of infraorbital floor, nasal cavity, frontal, sphenoidal, and ethemoidal sinuses and was reported as osteoma of maxilla [Figure 2]b. The patient underwent excision and curettage of the mass through a Fergusons incision under general anesthesia. One single large mass of bone within the maxillary sinus and multiple bits of bony tissue were curetted piecemeal. The inferior orbital floor was involved and was reconstructed using mandibular cortical bone graft to prevent eyeball intrusion into surgical defect. Given (H and E) sections showed sheets of disorganized woven immature bone and round cells having large vesicular nucleus and scanty cytoplasm [Figure 2]c. Focal areas of few bizarre multinucleated giant cells were seen. Few areas of irregular calcified spicules along with many areas of disorganized darkly stained immature bone with irregular margins having an acid-etched-glass appearance were present [Figure 2]d. A diagnosis of osteoblastic OS was given. No metastatic lesions were identified on a chest x-ray. Case was referred to higher oncology center where extensive surgery with adjuvant chemotherapy was done. After 1 year, the patient is doing reasonably well (under treatment for severe mental depression) and no recurrence or distant metastasis has been identified. 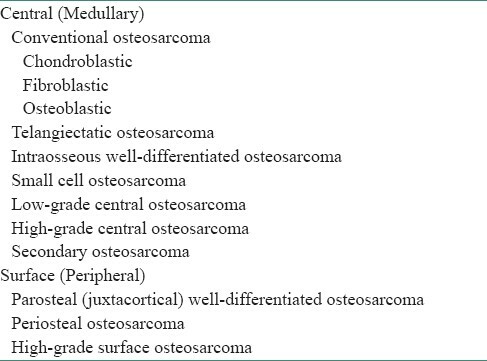 OS is the second most common malignant bone tumor after multiple myeloma. , These case reports demonstrate the diverse clinical, radiographic, and histopathological features of GOS and the difficulties encountered during diagnosis. 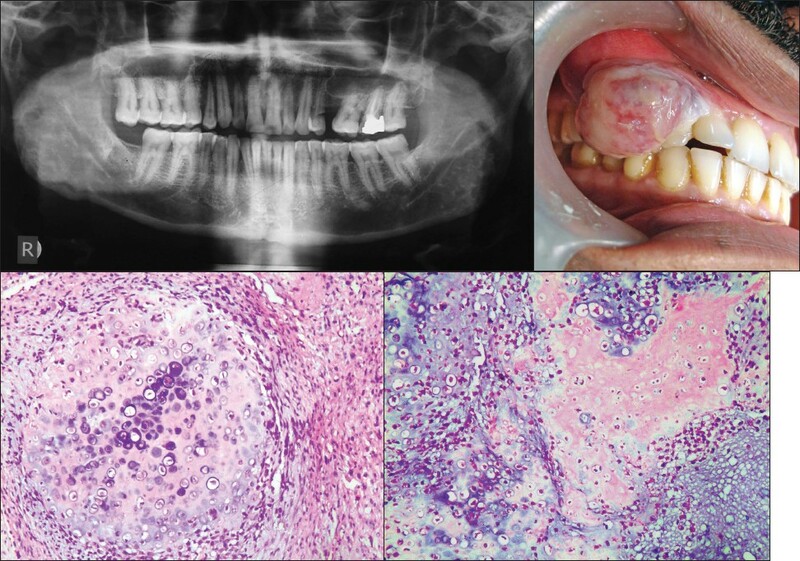 The reasons for the first case being initially misdiagnosed as peripheral giant cell granuloma could be rarity of OS clinically presenting as a well-defined sessile gingival swelling, OPG findings being ignored as no classical features were observed, and sampling error during histopathological examination. The second case reported with a chief complaint of nasal obstruction, which on CT imaging was suggestive of osteoma of maxilla possibly because of large solitary radiopaque mass with no classic OS features. Identifying the genes and signal transduction pathways responsible for the development of OS through more molecular research may help in the development of newer diagnostic markers and help improve therapeutics, leading to better prognosis and patient survival in the future. Dr. Krishnan Pisharodi, Anesthetist, prepared and managed the patients. Dr. Arun Kumar, ENT Surgeon, assisted in managing the second patient. 1. Raymond AK, Ayala AG, Knuutila S. Conventional osteosarcoma. In: Fletcher CD, Unni KK, Mertens F, editors. Pathology and Genetics of Tumors of Soft Tissue and Bone. 1 st ed. Lyon: IARC Press; 2002. p. 264-70. 2. Fernandes R, Nikitakis NG, Pazoki A, Ord RA. Osteogenic Sarcoma of the Jaws: A 10 year experience. J Oral Maxillofac Surg 2007;65:1286-91. 3. Amaral MB, Buchholz I, Freire-Maia B, Reher P, deSouza PE, Marigo HA, et al. 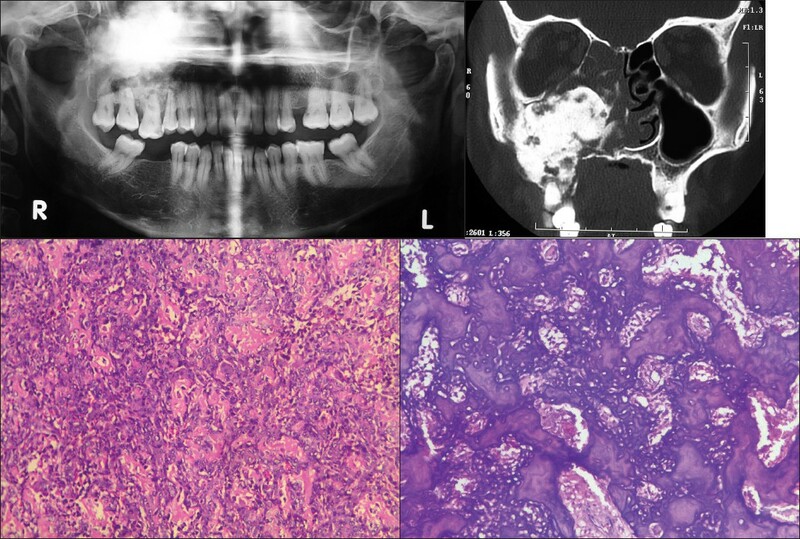 Advanced osteosarcoma of the maxilla: A case report. Med Oral Pathol Oral Cir Bucal 2008;13:492-5. 4. Warnock G. Malignant Neoplasms of the Gnathic Bones. In: Thompson LD, Goldblum JR, editors. Head and Neck Pathology. 1 st ed. Amsterdam: Elsevier; 2006. p. 492-7. 5. Angela C. Bone Pathology. In: Neville BW, Damm DD, Allen CM, Bouquot JE, editors. Oral and Maxillofacial Pathology. 3rd ed. Philadelphia: Saunders; 2009. p. 660-4..
6. Picci P. Osteosarcoma (Osteogenic sarcoma). Orphanet J Rare Dis 2007;2:6-10. 7. Ogunlewe MO, Ajayi OF, Adeyemo WL, Ladeinde AL, James O. Osteogenic sarcoma of the jaw bones: A single institution experience over a 21-year period. Oral Surg Oral Med Oral Pathol Oral Radiol Endo 2006;101:76-81. 8. August M, Magennis P, Dewitt D. Osteogenic sarcoma of the jaws: Factors influencing prognosis. Int J Oral Maxillofac Surg 1997;26:198-204. 9. Bane BL, Evans HL, Ro JY, Carrasco CH, Grignon DJ, Benjamin RS, et al. Extraskeletal osteosarcoma. Cancer 1990;66:2762-70. 10. Rajendran R. Benign and malignant tumors of the oral cavity. In: Rajendran R, Sivapathasundaram B, editors. Shafer's Textbook of Oral Pathology. 6 th ed. Amsterdam: Elsevier; 2009. p. 169-73. 11. McGuff HS, Heim-Hall J, Holsinger FC, Jones AA, O'Dell DS, Hafemeister AC. Maxillary osteosarcoma associated with a dental implant. Am Dent Assoc 2008;139:1052-9. 12. Zarbo RJ, Carlson ER. Malignancies of the Jaws. In: Regezi JA, Sciubba JJ, Jordan RK, editors. Oral Pathology. 5th ed. St. Louis: Saunders; 2008. p. 315-21. 13. Tang N, Song W, Luo J, Haydon RC, He TC. Osteosarcoma development and stem cell differentiation. Clin Orthop Relat Res 2008;466:2114-30. 14. Greene FL, Compton CC, Fritz AG, Shah JP, Winchester DP. 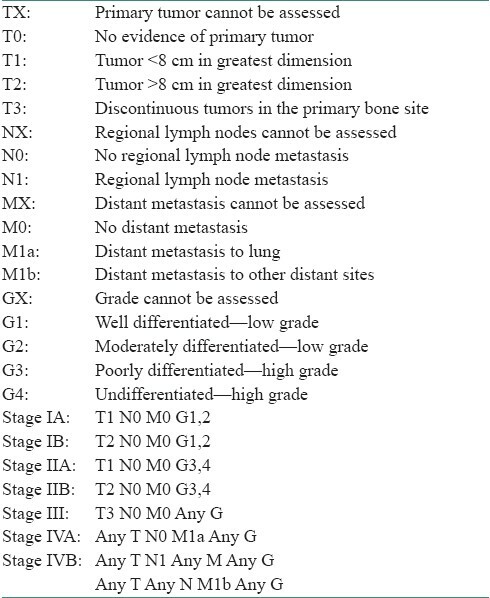 AJCC Cancer Staging Atlas. New York: Springer; 2006. p. 185-9. 15. Nielsen GP, Rosenberg AE. Update on bone forming tumors of the head and neck. Head Neck Pathol 2007;1:87-93.